First an apology as I have not been around as much as usual the last couple of weeks - that is because I have just started a new job :) But do not fear I am back with regular blog posting now in the run up to the Holidays and hopefully I will be able to find time for some video tutorials too. Today I am popping by to show you the items that I sent to my lovely customers in September. 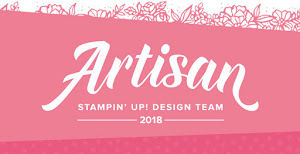 If you shopped with me via my online Stampin' Up! store or I processed your order for you, you should hopefully have received your goodies. 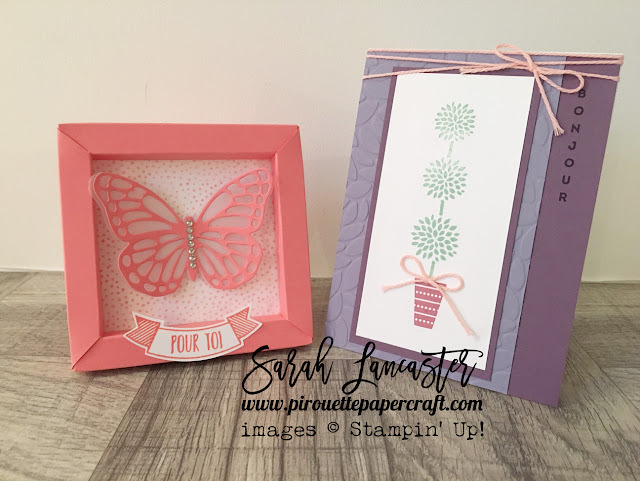 For all customers using my hostess code (see above right column) I created a little frame with a delicate butterfly die cut in card stock and vellum. I created these in the current In Colors (love them !!). The card on the right is the example that I sent to my french speaking customers along with their gifts. That's right - gifts ! I love to spoil my customers and this month everyone who shopped with me, regardless of the amount of the order, received some tea and biscuits in a little box make with the very versatile Envelope Punch Board. I CASEd this card from Pinterest - oh yes I love butterflies ! And finally, a similar colour scheme using the beautiful Pop of Pink collection and the Jar of Love set, an example of the thank you card that I sent to my english speaking customers. Of course everyone knows that I love shaker cards !! If you are local to me you are more than welcome to attend one of my Ateliers. We are a fun loving crafting group - and I have lots of lovely projects planned for Halloween and Christmas. You can find my planning HERE. Thanks for joining me today and be sure to check out my FREE card kit that I am offering to this months' customers with a purchase of £45/60€ or more.